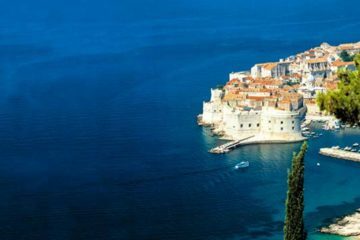 Our One Journey, 5 Countries tour, highlights the UNESCO Heritage sites of Croatia in Trogir, Split, Dubrovnik and Plitvice Lakes. It includes a visit to Enchanted Ljubljana in Slovenia and the lesser-known territory of Bosnia and Herzegovina. Sarajevo is a beautiful multicultural city in the heart of the Balkans. Also included is Serbia and Belgrade giving the traveler, even more, insights into the Balkan Mosaic. 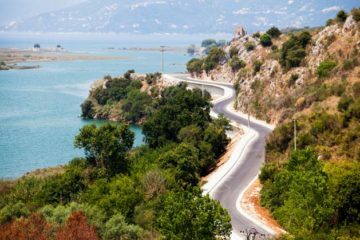 Enjoy this well-crafted tour of the southern Balkans. Third person in double room on extra bed has a 15% discount. Air-conditioned vehicle with driver at group’s disposal as per itinerary. Experienced tour leader throughout the trip as per itinerary. Sightseeing Tours: Zagreb, Zadar, Ljubljana, Plitvice lakes, Split, Dubrovnik, Sarajevo, Beograd, Novi Sad, Osijek. This might be a bilingual tour. Tour is not suitable for persons with restricted mobility. Transfer on the day of the tour from Zagreb airport, or another hotel in Zagreb to the tour hotel, rest of the day at leisure. Dinner and overnight in Zagreb/Zagreb area/. Morning sightseeing tour of Zagreb, Croatian capital city, gives you the opportunity to see the fortified Upper Town, the city’s historical center, St Mark’s church with its multi-colored roof, the Cathedral, Croatian National Theatre and the University. Through the carved facades of buildings and baroque churches, we see many green spaces and terraces of cafes where the locals like to gather. Early afternoon departure to Bled, small town in the Julian Alps which could be a setting for a classic fairy tale: immense natural beauty with mountains and forest surrounding an emerald glacial lake, an island in the middle of the lake with a church steeple and its wishing bell, a cliff top castle with picturesque views, and a well-known sweet treat, Bled cream cake. Bled, together with its surroundings, ranks among the most beautiful alpine resorts and is renowned also for its mild, healing climate and thermal lake water. Dinner and overnight in Bled/Bled area/. Morning departure to Ljubljana, Slovenian capital where you will have a guided tour of the most significant sights of its old center: the picturesque Central open-air Market and the Three Bridges, the Baroque Town Hall and Robba’s Fountain. 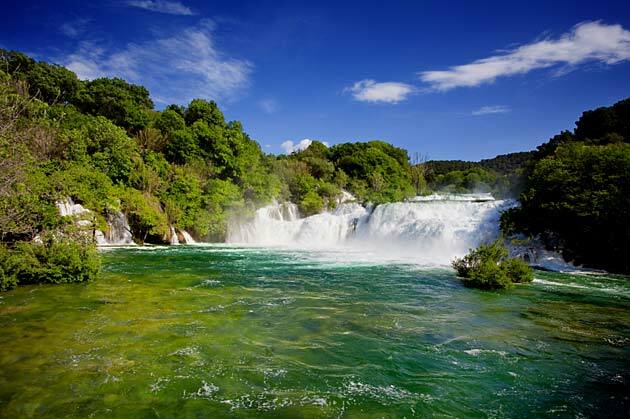 After Ljubljana we are continuing our journey to Plitvice lakes, well-known UNESCO World Heritage Site, natural beauty of the 16 crystal – blue lakes cascading into 92 spectacular waterfalls. Walk on the wooden promenades with magnificent views on the waters where every turn leads to a breathtaking scenery and yet another waterfall. Surrounded by dense woods, Plitvice lakes are a natural phenomenon of rare and unique beauty. Dinner and overnight in Plitvice area. Morning departure towards Zadar, where upon arrival we’ll be taking you for a guided walking tour through the Roman Forum from the 2nd century BC, passing by the 9th century pre-Romanesque church of St. Donatus as well as St. Anastasia church. Departure to Split. This afternoon our guide will uncover for you the secrets of the UNESCO protected Diocletian’s Palace and its cellars. This Roman emperor spared no expense for the construction of a sumptuous residence, importing best quality marble, sphinx and columns. The original palace was modified by its new inhabitants during the middle Ages, but making it even more beautiful and what it is today: the city’s living heart. Its narrow streets hide passageways and courtyards, some deserted and eerie, others lively and animated by the music from bars and cafes, or by the everyday life of its residents. Dinner and overnight in Split/Split area/. After breakfast, departure to Dubrovnik. Regardless of whether you are visiting Dubrovnik for the first time or the hundredth, there’s that sense of awe when you set eyes on the beauty of this old town. Immerse yourselves into the symphony of the city’s marble streets, baroque buildings and the endless shimmer of the Adriatic. Upon arrival, city tour of this UNESCO protected Pearl of the Adriatic and its Cathedral. Dinner and overnight in Dubrovnik/ Dubrovnik area/. 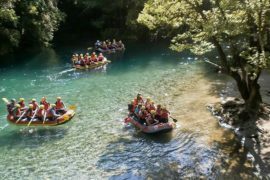 Optional excursions to the island of Korčula. Korčula holds indisputable a privileged position among the Croatian islands. Here we find more legends, tales and monuments than anywhere else. Being famous stonemasons, shipbuilders and seafarers the people of Korčula left their marks all over the world, but they saved their best works for their own city. Experience the narrow streets, beautiful churches and magnificent palaces in one of the best preserved Medieval towns in the Mediterranean. After sightseeing free time for lunch or even swimming. On the return a stop will be made in one of the well-known wine cellars of the Pelješac peninsula to sample some of the excellent local wine. Dinner & overnight in Dubrovnik/ Dubrovnik area/. Morning departure to Mostar, city of bridges, where the traveler from the south gets the first glimpse of the continent beyond. Orientational walk with your tour leader in Mostar and free time for lunch. Departure to Sarajevo, the capital of Bosnia and Herzegovina. Sarajevo is one of the historically most interesting cities in Europe. It is the place where the Western & the Eastern Roman Empire split and where the people of the Orthodox East, the Ottoman South and the Roman Catholic West met, both an example of the clash of civilizations and of historical turbulences and a beacon of hope for peace and tolerance, reached through multi-cultural integration. City tour of Sarajevo upon arrival. Dinner and overnight in Sarajevo/Sarajevo area. Morning departure to Belgrade, capital of Serbia. Short break will be made in Zvornik, charming little town in the northeastern Bosnia on Drina river. Belgrade is situated at the place where Sava joins the Danube river. There are spots in Belgrade you must definitely see and feel. Streets, squares, monuments, parks, fountains, archeological sites. Many of them have been given the status of cultural assets. Upon arrival a guided tour of this beautiful city between two rivers famous by its sunsets. Dinner and overnight in Belgrade. Morning departure to Novi Sad (Serbia’s second largest city), located on Danube river. Novi Sad’s position at one of the continent’s true crossroads and history as a multinational commercial and transit center has left it endowed with historical and cultural sights that even much larger cities have difficulty matching. Novi Sad has much to boast about, from the imposing fortress on the opposite bank to the churches representing numerous denominations throughout the old town’s exceedingly pleasant pedestrian zone to several unheralded but noteworthy museums and art galleries. Our local guide will show us all „must see“ locations. After the guided tour of Novi Sad we will continue towards Ilok. You will have opportunity to taste wines in one of the famous Croatia wine cellars “Iločki Podrumi” followed by traditional lunch. On our way to Osijek we will stop in Vukovar which is the biggest Croatian river port located at the confluence of Vuka River in Danube, a town also known as a symbol of the Croatian war for independence, as it arose from the ashes of the ’90s into the proud city that it is today. In the late afternoon hours we will end this day. Overnight in Osijek or Vukovar. You will start you morning with the city tour of Osijek. Osijek Pancake – flat, rich in rivers, Slavonia has unique natural wonders and delicious regional cuisine that will take your breath away: endless plains, the intense yellow of its corn and sunflower fields, the flavors of its cuisine that will make all your senses travel…. Osijek, the largest city in eastern Croatia, beautifully settled on the banks of Drava river. Osijek remains a popular tourist destination for its Baroque style, open spaces and lots of recreational opportunities. Located in one of the most fertile and most certainly the biggest agricultural area of Croatia, the town is its semi-official gastronomic capital. City tour passes by the Cathedral and the Tvrdja (Old Fort). We are continuing our drive and the first thing you see when approaching Djakovo from either side is the brightness of the bricks of the two towers and cupolas of its Cathedral, beauty of which welcomes the visitors. After the visit, departure towards Zagreb followed by a visit to the Ethno Village of Stara Kapela for a lunch/no drinks included/ of the products of the Panonian soil. Departure transfer from the tour hotel to Zagreb airport or hotels in Zagreb. If you have any questions or you’d like to book this trip, please contact us. Custom itineraries available to this or any of the destinations we travel to. Kutrubes Travel has SPECIAL AIRFARES – Contact us for details. 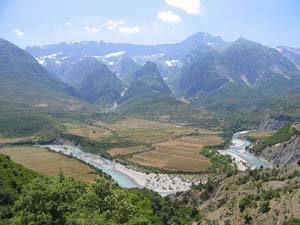 Kutrubes Travel also offers a variety of other tours throughout this region. Contact us for detailed itineraries and descriptions. 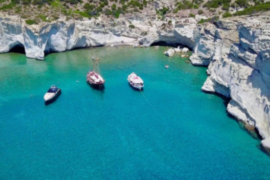 For over a century, Kutrubes Travel has helped plan detailed journeys for thousands of leisure travelers, families, business people, relief organizations, government officials, and religious pilgrims alike. Our travel experts have personal, first-hand knowledge of our destinations to make suggestions for a one-of-a-kind adventure. © Copyright 2017 - Kutrubes Travel. Website Design by Tomo360 | Terms & Conditions.